Call today at (404) - 377 -8000 SPECIAL PRICING ! Call (404) - 377 - 8000 for details ! Pack your bags and get ready for your next camping trip with this travel trailer. You will enjoy the space the slide out provides, and within the slide, there is a U-shaped dinette where you can enjoy your meals or this area can double as additional sleeping space. Fold out the Murphy bed each night for a good night's rest and in the morning, you can fold it away and enjoy a cup of coffee on the sofa. This unit features a kitchen with a three burner cooktop, a microwave, and you'll appreciate a pantry for snacks. Bring along the extra lawn chairs with a pass through storage included in this travel trailer, plus there is an exterior storage for your luggage or tackle boxes. After a day hiking, clean up in the convenient rear corner bath. 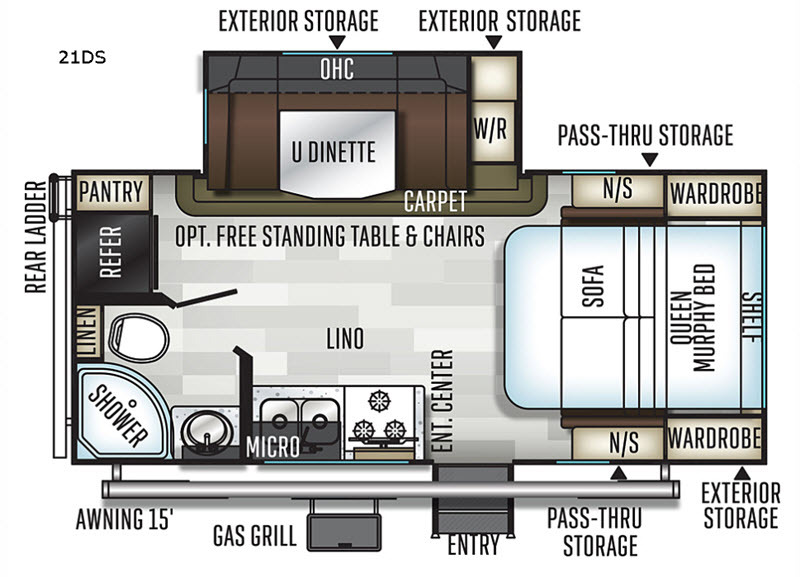 Make this travel trailer yours today! For any camping trip you will want a Flagstaff Micro Lite travel trailer! These models have a beautiful Slatewood interior with Hardwood cabinet doors and drawer fronts. Each unit features solid surface countertops, a three burner range with a glass stove top cover, and a WIFI Ranger Booster Sky 4, so you can stay connected while you camp. Along the exterior there is a fully aluminium frame, a radius roof with interior vaulted ceilings, which provides you the most headroom, plus an outside shower, and a power awning with LED lights. The Standard Package D offers features such as a fully enclosed underbelly, outside speakers, a multi zone stereo with DVD/CD/AM/FM and Bluetooth control, plus so much more! What I'd improve: Lower height for less wind resistance when towing. An RV Salesman Will Be Contacting You Soon. Know someone who might be interested in this RV? This just sends them a link to it so they can take a look. We have received your review and will be confirming it shortly.